Most little girls (and not a few little boys) dream of owning their own horse. This dream can last well into adulthood; many people who never had a chance to ride, when young, find themselves able to buy a horse later in life. There are also those lucky children and young adults who have the great good fortune to already have a horse. Having a horse can be so delightful; you can ride any time you like, you can really develop a relationship... it's magical. Even when properly managed, horses can become desperately sick or can be injured--in fact, horses are very clever about finding ways to injure themselves. And should your horse need treatment, a horse's vet expenses are much, much more than a dog's. 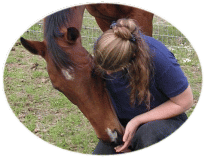 Horse owning is wonderful, tremendously so; but it is important to be well aware of the potential expenses of regular upkeep, and also to be informed about proper care of the horse. The purchase price of a horse can be a very small amount compared to maintaining the horse. If you don't have your own property, you must pay for him to be kept somewhere; even if you don't pay to board him, you must pay to feed him, get him regular (and sometimes emergency) medical care, and to buy/replace any equipment needed. This section has information on what my horses cost me regularly; costs can vary dramatically depending on your region and even on things like the weather (in drought, the price of hay goes way up, for example). When an emergency is in progress, it's too late to go out and get the proper supplies to deal with it. You can't know what will happen in advance, so it's best to be prepared for whatever your horse throws at you. Your preparation for emergencies should include first aid supplies as well as knowledge of how to use them. When you buy a horse, you usually need a fair number of supplies to care for and ride the horse. These include things like a saddle and bridle, but may also include buckets for feeding/watering, horse blankets, and so on. Any horse in a sandy environment is at risk for "Sand Colic." A horse needs mostly fiber. His body is designed to continually digest grassy foods. Fencing can have a huge impact on your horse's soundness and health. Horses don't see the way people do. Their up-close vision is more blurry; they can't see directly in front of themselves. Their eyes are aimed more at the ground than straight in front of them. In general, anything that is hard to see can hurt them, and they can avoid anything that is easy to see. Fencing must be safe for horses. If they're interested in something on the far side, they may paw at it. They may try to stick their heads through the fencing in order to get at grass or interesting objects on the far side. A frightened or enthusiastic horse may be too excited to pay attention to known borders, and run right into a fence. Horses can jump quite high if they set their minds to it. Fences must be set up with all of these in mind. Do Off-Track Thoroughbreds (OTTB's) make good riding/competition horses? Many TB's are quite talented, but acquiring one off the track has more complications than starting a green horse. Track TB's have a very different lifestyle and training experiences from most other disciplines. It's also important, if you're looking for an ex-racer, to be sure that the horse is sound for your discipline; some may be sound for any discipline, some sound only for flatwork, or sound only for light riding--or pasture-sound only. I'll discuss what to do to help re-start your TB; it's up to you to pick one who can accommodate your interests.